Boot camp is a structured environment for children that have behavioral issues. Boot camp can be used as an alternative to juvenile detention facilities and court ordered probation. Some parents voluntarily enroll their children in boot camp programs in the hopes of providing structure and enforcing proper forms of discipline. Boot camps are managed by a trained staff that specializes in behavioral therapy, mental illness and psychotherapy. The age range for most children who attend boot camps is between 10 and 18. Children are sent to boot camp facilities by their parents. Boot camp may be recommended by a family doctor or school psychologist who feels the child may benefit from a structured environment. The child must show signs of defiance or poor commitment in school or at home. This could include truancy, violent tendencies, verbal abuse and running away from home. When parents have exhausted all other options, including a complete medical evaluation to test for an underlying mental illness, meeting with a boot camp that deals with behavior problems is the next step. There are several hundred boot camps set up throughout the U.S. Each camp focuses on a specific need and specialty. Some are Christian based and focus on positive discipline in a Christian environment. Faith based camps may provide designated times of the day for spiritual connection and prayer. Military style boot camps focus on rigorous physical exercise drills that teach children strength and self form. 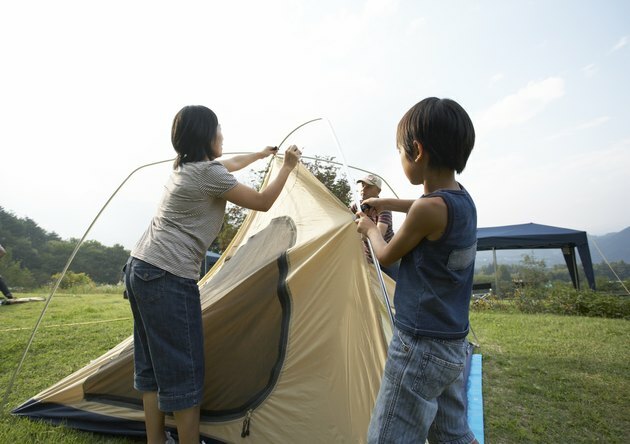 Wilderness camps show children how to become one with nature and survive the harsh elements of the outdoors. They also teach teamwork and achievement through reliance on their peers. Some camps are in a ranch setting where the children learn responsibility by caring for animals and crops. All of these camps can be combined with group and family therapy sessions to make the transition home successful. Boot camp gives children them the skills they need to be successful children and adults in everyday settings. Physical discipline teaches them how they can use their bodies and their strengths to be healthy. Anger issues can be resolved by learning how to cope with feelings of anger and resentment by turning them into positive choices. Recreation specialists push the children to their physical limit and show them how to let go of bullying, family resentment and sibling rivalry. Some of the activities may include wilderness hiking, military style basic training, mountain climbing, equine therapy and community service programs. In addition to counseling and disciplined physical activity, some camps also offer enjoyable rewards for the children. This may include campfire night, sports activities and social interaction. Most boot camp settings for children are safe and take places in a structured and closely guarded environment. Kids who have severe depression, anxiety and diagnosed behavioral issues such as bipolar disorder and Oppositional Defiance Disorder may not benefit from large boot camp therapy. All children will be required to have an extensive medical exam before being admitted to camp. Those with a physical handicap, pre-existing medical conditions such as diabetes or conditions that weaken their immune system may not be able to attend due to the vigorous physical exercise and exposure to weather elements. Boot Camps Info: What Are Boot Camps?